Guys, it's almost fall! I think I'm in that minority of people that is super excited to see summer go. Sure, its nice to have some time off, and the gardens always look gorgeous with an array of colours. But there are also wasps and misquotes, heat waves and heat rash, construction and . . . well you get my point. I'm not a fan. But what has been exciting me are all the fall launches that have been coming out. I've been especially impressed with a lot of the clothing options this fall--we're seeing a lot of lace, drapey silhouettes, printed pants, and suede finishes. For today's post, I thought I'd share some of my favourite pieces I've been eyeing over the last few weeks. 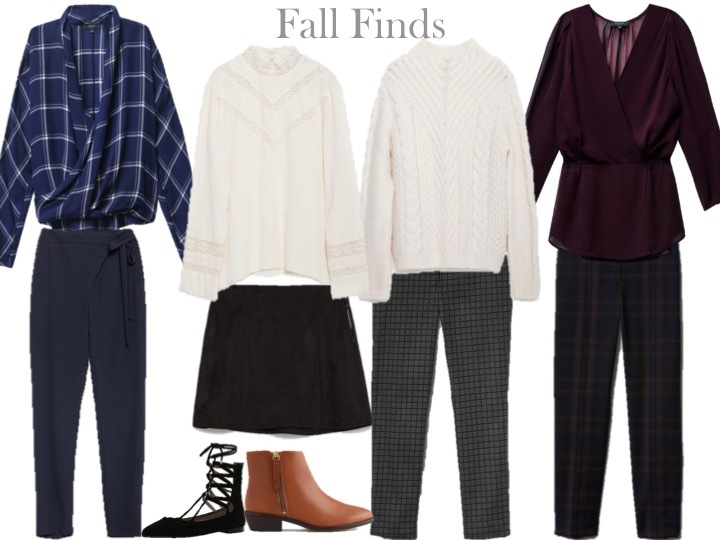 I can easily imagine myself wearing these 4 outfits nonstop this fall! (Also, look that that amazing alliteration in the title--it just doesn't work in the summer). Let me know what you've been loving for fall!